Since I’ve been talking so much about handicapping angles on my podcast recently, I thought now might be a good time to show readers how to construct and use one. To start with, let’s define what an angle is. A handicapping angle is simply a methodical means of analysis and selection; it is not a shortcut to riches and glory. Contrary to popular opinion, handicapping angles needn’t be one dimensional either. It is entirely possible — and, frankly, desirable — for angles to possess comparative features, as well as the ability to make relative assessments based on the competition a horse is facing. What makes angles desirable is that they bring structure to one’s play and they can be tested. This latter point is important because it allows players to form expectations and, as a result, develop optimal betting techniques. 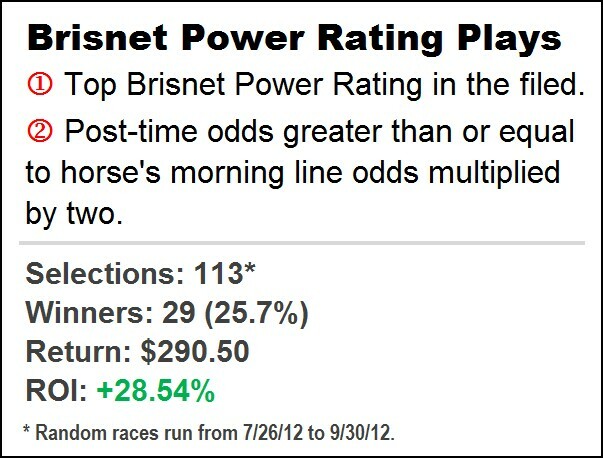 1) Consider only the horse(s) with the highest Brisnet Power Rating. NOTE: This instantly puts one on a “live” horse based on traditional handicapping criteria — speed, pace, class, etc. 2) Play qualifying horses provided their final odds are greater than or equal to their morning line odds multiplied by two. 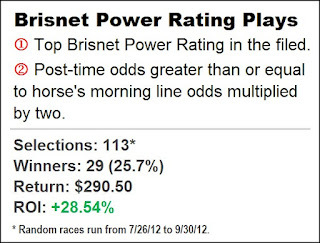 For example, if Horse A has the highest Brisnet Power Rating in the field and is 5-2 on the morning line, we would bet him/her at odds of 5-1 or greater. NOTE: The purpose of this rule is to isolate overlays. And, as demonstrated in my last column “Thinking Small,” the morning line can be helpful in this endeavor.